"I was just a tennis ball. Even when people press me down I will always bounce back and the more I felt pressed down I would bounce back even higher." Confidence Tshivula is 22 years old. She grew up in Diepsloot and graduated from the Diepsloot Combined School (DCS) which is the school where I volunteer twice a week. 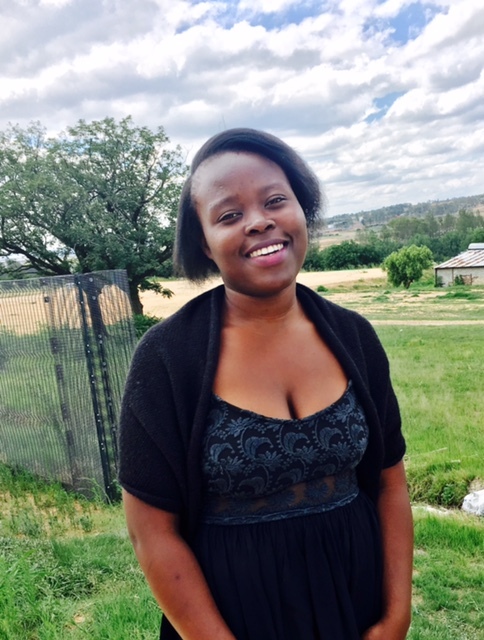 Confidence is studying accounting at the University of Johannesburg (UJ) and she will graduate with a diploma in March, 2017. A few months ago I read an essay that Confidence wrote about her experiences as a varsity student. I was fascinated and asked if I could interview her for my blog. I told her that my blog has a relatively small readership as I didn't want her to get overly excited thinking a book or movie deal would be forthcoming. Fortunately she agreed to talk with me anyway. When I saw Confidence for the first time she was standing outside of the Mugg & Bean where we had planned to meet. She was dressed in a black dress and a short sleeved black shrug sweater. I was immediately struck by how cute she is. She's short with a pretty heart shaped face. In many ways Confidence is similar to other 22 year old women. She grew up in a family with her mother, father and two younger brothers. She has big hopes and dreams for her future. Sometimes she gets frustrated with her parents but she never argues or fights with them as that is not permissible in her culture (that part is definitely not similar.) She wants to get her driver's license, loves art, likes to draw, paint, sew and make pillows. She can also play the guitar. The first question I asked was about her name. I learned that her African name is Ndivhuwo and her English name is Confidence. She told me that it was her father that named her. It is not unusual to meet African people with all kinds of interesting and quite honestly AWESOME names like Beauty, Surprise, Polite, Blessing, Sonnyboy, Tears and more, but I have never met anyone named Confidence and Confidence told me that she has never met another Confidence either. In 1999, when she was five, Confidence came to live in Diepsloot from the rural South African province of Limpopo. She'd been living with her grandmother as her parents had come to Joburg to look for work. When she arrived and joined her parents she only spoke Venda, one of the 11 official languages of South Africa, but she attended a creche (nursery school) and quickly learned to speak Zulu, Xhosa, Sepedi and English. In Limpopo, the family lived in a large shack with three rooms. In Diepsloot, their shack was much smaller. They lived in the small shack until 2001 when they were granted an RDP House in Diepsloot. RDP stands for Reconstruction and Development Programme which in addition to other things, provides government subsidized homes for poor people as part of a larger plan to try to address the consequences of apartheid. Confidence still remembers how excited she was to move into a real house and to have her own room. Her parents still live in the same house and Confidence still has a room there although her family has turned it into somewhat of a storage area as she is living away from home much of the time attending university. As a child Confidence wanted to become a doctor. This dream began when she and a childhood friend were playing and the friend fell and cut herself. Confidence cared for her friend and bandaged her cut. From then on everyone told Confidence that she should be a doctor when she grew up and so she decided that she would. Although she enjoyed attending DCS school was not easy and she says she was only an average student. She worked hard but when she applied for university she was told that her grades were not good enough to study medicine. She and her father went to a meeting with an admissions officer who made this point clearly and definitively pulling a stack of transcripts out of a drawer and showing them to Confidence and her father saying, "look at the grades of these students, these are the people who can become doctors, not you." Confidence thinks that her dad was disappointed to hear this news but Confidence quickly bounced back and decided she would study to become a fashion designer. At DCS she was known to be an excellent artist. She was so good that the principal gave her the keys to the art room so she could access it at any time. In addition, leading up to the 2010 World Cup there was an art contest at school. The student with the best drawing would win a ticket to the event. Confidence was the winner. But when Confidence told her father that she wanted to become a fashion designer he said no, that there was no money in it and it was then decided that Confidence would study accounting. As a person who possesses absolutely no mathematical skills, I am impressed by people who can do even simple calculations. But when I asked Confidence if she liked accounting she only replied "I am doing accounting. I am doing accounting." As we talked, I mentioned that I agreed with her father, that it might be difficult to earn money as a fashion designer or an artist. I felt badly immediately after I said it because her whole face changed and she looked really sad. I guess I forgot what it's like to be 22. After graduating from DCS Confidence was excited to begin attending university. You would think that if one could somehow survive life in Diepsloot with all the drugs, violence, dirt and crime and if one could achieve grades good enough to be accepted to university that things would then be o.k. Unfortunately this is not the case. Even if students from Diepsloot are accepted to university and even if they somehow manage to find the money to pay their school fees through financial aid and bursaries, they still have no money for books, transport to school, student housing or food. Many talented students have had to drop out of university because they simply can't afford to live while going to school. Confidence attends university at the UJ campus located at Klipspruit Soweto. Klipspruit is about 45 kilometers from Diepsloot so in her first year she had to live near campus as she had no money to pay for transport. Confidence and a friend rented a small one room shack with one window and a dirt floor in Klipspruit. The landlord promised them that he would put down a real floor with tiles. He also promised that he would fix the holes in the roof and the walls but he never did. Every time it rained water poured into the shack and all of their books and clothes got soaked. Rats entered the shack through the holes in the wall. Eventually the roommate moved out taking all of her furniture with her. Confidence was left with nothing except for the rats, who she admits she talked to when she was lonely, and a dirt floor to sleep on. Confidence continued to have problems with the landlord as her rent was due at the end of each month but her parents did not get paid until the 2nd of the following month. She tried to explain this situation to the landlord and also tried to earn her own money by offering her services as a hair stylist but there was never enough money to close the gap and she never paid the rent on time. After her roommate moved out the landlord cut off the electricity to the shack and he took away her keys so that Confidence could no longer lock the shack door. She studied by the light of her cell phone but she was too scared to sleep in the shack with the door unlocked. Dogs from the neighborhood would chase the rats and the noise would wake her up at night. She would often wake up to find the shack door wide open. More to come from my conversations with Confidence in my next post.